Healthcare reforms have prompted hospitals across the country to improve cost efficiencies and recoup expenses wherever they can. 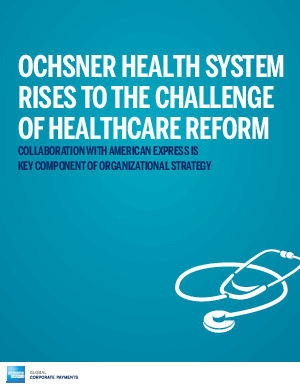 In response, the accounts payable department of Southern Louisiana’s Ochsner Health System—the region’s’s largest non-profit, academic, multi-specialty, healthcare delivery system—developed a partnership with American Express that helped improve cash management while reducing costs. In doing so, it actually recast itself as a role model for efficiency across the Ochsner organization—a role unheard of in a traditionally back-office department.